John Forsyth has retired after 25 years as the principal of Monrad Intermediate. He talks with Karoline Tuckey about how he thinks the school fits into the Highbury community. Quarter of a century of leadership leaves a mark on a school, but the imprint made by departing principal John Forsyth at Monrad Intermediate extends well into the community. Forsyth exudes a firm but fair presence. He’s the kind of headmaster you know is several steps ahead of you if you’re called to his office, and who is carefully watching out for your welfare. His eyes sparkle when he talks about children who have attended Monrad – both those who have already had success and those he knows faced struggles. Any discussion of challenges and injustices faced by families, or by teaching staff navigating the demands of the industry, immediately shows a depth of empathy and care about the complexities of these situations. It also shows up a determined belief in fighting for better solutions. “There’s a lot of hardship here in the community. The topics Forsyth wants to talk about show a continuing passion for action to fix these issues. He talks about white flight from the school, his belief more te reo should be taught in schools, and promoting opportunities for kids to take part in sports, culture and the arts – including removing financial barriers for disadvantaged children. As education programme coordinator for Highbury community services group Te Aroha Noa, Jodie Matenga-Philips says Forsyth’s input into the community has been meaningful. He is often seen at community meetings, and supports many initiatives and community groups beyond his work at the school. “If you were to mention John Forsyth to any 20-year-old in Highbury they’d be able to tell you really neat things about him. During his 25-year tenure the school’s reputation has been lifted. “I hear it all the time, back in the earlier days there was lots of gang issues”, she says. “There wasn’t a whole lot of help for kids, at school sports was the only reason they went to school, but he’s been a strong advocate for Monrad and for Highbury. Wes Va’ai-Wells went to Monrad as a pupil in 1995 and 1996. In 2007 he returned as a teacher, and has been part of the staff since. Forsyth was a strong, supportive figure for him and his friends during school, and all remember a principal who talked with them in the playground, and asked after their families by name, he says. A comment he often hears is appreciation of how Forsyth still remembers former pupils by name years later and stops to talk when he meets them in the street. “He was always looking out for kids and taking a huge interest,” Va’ai-Wells said. “It was definitely a place where kids grew their sense of belonging. As a teacher, Va-ai-Wells says Forsyth’s focus on relationships has created a strong, collaborative staff, which fostered development. Collaboration with families and community groups also fed back into the classroom. “He has made Monrad into a very cultural school, and he put himself out there, so the community could see that he supported them. Ross Intermediate School principal Wayne Jenkins said Forsyth’s support of sport boosted children from the wider region and beyond, when he started the Super Sport Competition between intermediates from Whanganui, Masterton, Levin and Manawatu. Forsyth went to teacher’s college in 1968 and 1969, and started teaching in 1970 in New Plymouth. His first position was at a New Plymouth school, then Waiouru, before he headed overseas to work for a couple of years. He came back to a position at Marton Junction Intermediate and later became principal at Featherston primary school. He then started at Monrad Intermediate in 1992. “It’s when you have adults come up to you and say ‘I remember my time at Monrad Intermediate, it was the best time I had at school’, and seeing some of those children enjoying huge success. In his 25 years, he says there’s been good and bad changes in education, but when teachers get time with their kids, good teaching is still good teaching, and kids are still kids. 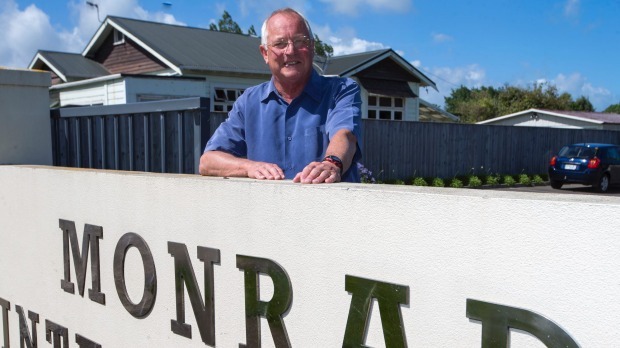 Tomorrow’s Schools in 1989 was one of the more positive steps for Kiwi classrooms, and he hopes the self-governing Board of Trustees system will stay. “It’s a really good idea. It gives schools the authority to be able to employ their own staff. Increasing “individualisation” in teaching for each child’s needs is another strong positive. However, bureaucracy has increased and some major political input has been seriously misguided. The current model also pits schools against each other to compete for pupils, and the introduction of charter schools and bulk funding are some of the biggest concerns on the education horizon, he says. There is a huge amount of top quality educational expertise, and “very clever” thinking in the New Zealand industry, so answers tailored to suit local problems should be sought here from the people who know how our system is working. “Unfortunately, a lot of initiatives that are brought in from the politicians are brought in from overseas, and they should really focus on New Zealand, what is really happening in New Zealand and what can we do to improve it. Monrad Intermediate’s strong cultural focus and inclusion of Maori and Pasifika elements is a strength for all at the school, and a point of pride, he says. He shakes his head in frustration at some families’ choice to send their children to schools outside the area because the school is seen as being for “brown kids”. “It’s a very nice coming together and meeting of people and cultures. However, Matenga-Philips says many in Highbury have taken pride in the cultural richness their children benefit from, and it is celebrated. Forsyth clearly loves his school, and while he’ll miss it, he is excited about the next chapters for the school and the new strengths and interests the next headmaster will bring. Next up is a trip to Vancouver, Canada with his wife to visit their daughter and her family, with some sightseeing on the side. Then he has a number of projects at home he looks forward to devoting more time to.